have to buy your car from Young Marmalade, and it has to be a low-powered car, but it’s the black box that’s new. Though not as new as you might think. 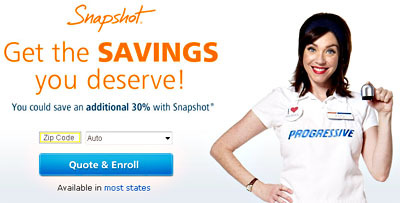 I’ve been watching commercials for over a year touting the “Snapshot” program from Progressive Insurance, and it’s pretty much the same thing. You get a black box from Progressive, plug it into your car’s diagnostic port, and they track your driving habits. If you drive safely, you get a discount. If you don’t drive safely — well, they say that nothing will happen at all. You’ll just keep paying your usual rate. I have no idea if that’s true in real life. In any case, the whole thing is fairly crude, tracking only enough information to determine how many miles you drive and how often you make sudden stops. No GPS, no information about exceeding the speed limit, or anything like that. Just sudden stops. But how private is this information? We won’t share Snapshot data with a third party unless it’s required to service your insurance policy, prevent fraud, perform research or comply with the law. We also won’t use Snapshot data to resolve a claim unless you or the registered vehicle owner gives us permission. That actually seems like a pretty broad exemption, so your driving habits might not be quite as closely held as you’d like. And I wouldn’t be surprised if future black boxes get more sophisticated about the amount of information they collect. On the bright side, you can get a 30% discount on your insurance rate! When you consider that most of us are willing to turn over practically our entire private lives to online companies in return for a free song from the iTunes store, that’s probably pretty enticing. Welcome to the future.